A shopping trip changed Cammy Ronchetto’s life. I still remember, 12 years later, how those words stung. Of course I’d known I was overweight, but hearing it from a stranger in public felt like a kick in the gut. My eyes filled with tears, and I rushed out of the store. Believe it or not, I was so skinny as a kid that my nickname was “Bony.” I ate whatever I liked–Doritos, fried chicken, and twice-baked potatoes heavy on the cheese and sour cream–without gaining an ounce. But when I became pregnant at 22, I put on 50 pounds because I took “eating for two” literally, even after my daughter was born. 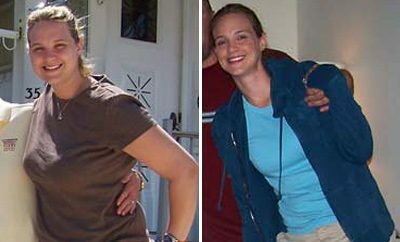 Five years later, in addition to a second child, I gained another 25 pounds that wouldn’t budge. When I tipped the scale at 187, I was so frustrated I smashed it into the trash. Yet I felt powerless. I tried dieting and once even lost 30 pounds, but gained 45 back because I just couldn’t find the motivation to stick with it–until that dreadful shopping trip. From Wal-Mart, I drove to McDonald’s and downed double orders of McNuggets and fries, hoping the food would make me feel better. As I looked at the empty containers strewn across my car seats, I felt sick and realized I desperately needed help. 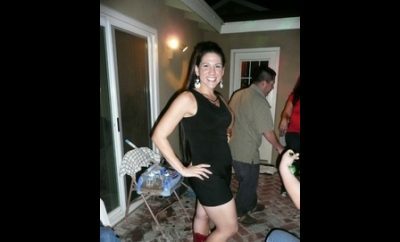 That night, I called Weight Watchers. I had seen the company’s ads, and the testimonials from real women convinced me to try its program. Two days later, I went to my first meeting, where I basically learned that everything I had been doing–eating huge portions of high-fat, high-calorie foods–was wrong. Following the program’s advice, I started to substitute water for sugary drinks and ration my snacks. Instead of an entire bag of Doritos, I would eat only a handful. Weight Watchers recipes and guidelines, such as broiling or baking instead of frying, helped me cook healthier meals. And to satisfy any hunger, I ate more fruits and veggies, which I actually liked. 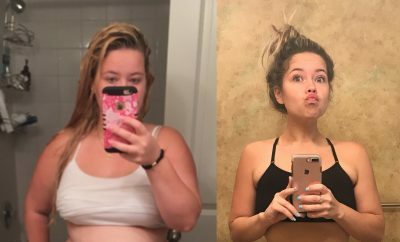 In just 2 weeks, I lost 6 pounds. My husband, Jim, helped with the kids and dinner on nights I had Weight Watchers meetings. Linda LaFontaine, my boss at the nursery school where I work, became my biggest supporter. She’s a competitive runner who had long encouraged me to exercise. Now she offered to set up a running program for me as soon as I lost 15 pounds. After 2 months, I was ready for my first run at a local trail. My heart was racing, more out of fear of disappointing Linda and of being embarrassed than anything else. After a brief “this is not a race” speech, Linda slowly trotted down the tree-lined path while I shuffled behind, huffing and puffing. The route was only 1/4 mile, but halfway through, my legs felt as heavy as oak trees and my knees as creaky as old hinges. I wanted to quit. But I kept lumbering along because I wanted even more to succeed. “You did it!” Linda screamed as I reached the end of the trail. From that day forward, once a week I went to Weight Watchers, and every other day I ran with Linda. Running not only reduced my stress but also helped me think of food as fuel, which helped me cut out junk. After a month, I could run a mile, and I had lost another 5 pounds. That’s when Linda suggested I set a goal to do a 5-K (3.1 miles) race as a way to stay motivated. Two months later and now down to 160 pounds, I stood behind about 150 other racers. I felt like an intruder in a foreign land until the starting gun startled me forward. Step by step, I made my way along the asphalt street. At the halfway point, my feet were hurting, but I looked at all the shoes of the runners in front of me and pushed on. Although I was one of the last to finish, I’d never felt prouder. My next goal was a 10-K. On race day, 3 months later, I was down a total of 45 pounds, to 145. One year after joining Weight Watchers, I hit my weight loss goal–60 pounds–and celebrated by running a half-marathon (13.1 miles). From there, I ran a marathon; learned to mountain bike, kayak, and rock climb; and began competing in adventure races, team events consisting of various activities. The body I once hated is now taking me to places such asBrazil,Switzerland, andFijito race. Who knew a trip to Wal-Mart would be my ticket to see the world? 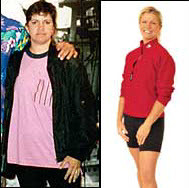 ← Previous Story Read on to learn how Laura shed 73 pounds right here!